Mr. DeBoer joined the faculty at Joliet West High School in the Fall of 2003. 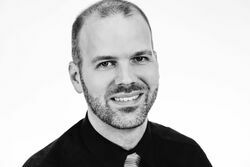 Mr. DeBoer holds a Bachelor's degree in Music Education from North Park University (2002) in Chicago, and a Master's Degree in Music Education from VanderCook College of Music (2007) in Chicago. While completing his degrees, Mr. DeBoer studied conducting with Dr. Rollo Dilworth and Dr. Robert Sinclair, as well as piano with Dr. Terree Shofner-Emrich and Dr. Rollo Dilworth. Since coming to Joliet West, Mr. DeBoer founded the Songs of the Season dinner and Opera Scenes program in 2004 and the Joliet Choir Contest in 2016. Since 2003, the Joliet West Concert Choir has received a first rating at the ISHA organizational contest (2006), and two first ratings (2008, 2009), and a second rating (2007) at the Elk Grove High School Invitational. Twice, the bass section of the Concert Choir has received "Best Bass Section" (2007, 2008), and once "Best Soprano Section" (2010) at the Elk Grove High School Invitational. The Concert Choir was also named "Grand Champion" of the Music in the Parks Festival on four occasions. Mr. DeBoer has twice been nominated for a Grammy Award for Outstanding Teacher, in 2016, Mr. DeBoer was named a "Teacher of Distinction" by the Golden Apple Foundation and in 2017, Mr. DeBoer was named a Celebrated Teacher by DePaul University. Musicals: Pirates of Penzance (2004), Cinderella (2005), My Fair Lady (2006), Narnia: The Lion, the Witch, and the Wardrobe (2007), Too Many Sopranos (2008), Little Shop of Horrors (2009), Disney's Beauty and the Beast (2010), Secret Garden (2011), Fiddler on the Roof (2012), Crazy for You (2013), The Music Man (2014), Into the Woods (2015), The Light in the Piazza (2016), Cinderella (2017), The Addams Family (2018), and Narnia (2017). Opera Scenes: "Scenes of Murder": Don Giovanni, Hänsel and Gretel, & Dialogues of the Carmelites (2004); "Mozart's Music": Marriage of Figaro & The Magic Flute (2005); "Romantic Work": Carmen & La Bohéme (2006); "Champagne": Die Fledermaus (2007); "Scenes of Murder": Dido and Aeneas, Don Giovanni, Hänsel and Gretel, & Dialogues of the Carmelites (2009), "The Crazy Things We Do for Love": Barber of Seville, Cosi Fan Tutte, L'Elisir d'amore, & The Magic Flute (2010), "Speak No Lies": Carmen, Der Freischütz, Gianni Schicchi, & Macbeth (2011), "#firstworldproblems" La Bohéme, Rusalka, & Utopia Unlimited (2012), "Battle of the Sexes" The Magic Flute, The Marriage of Figaro, and The Cunning Little Vixen (2013), "Deception" Gianni Schicchi, Pirates of Penzance, & Die Fledermaus (2014), "Crime and Punishment" Romeo and Juliet, Don Giovanni, Hansen and Gretel, & The Fairy Queen (2015), "Gilbert and Sullivan" The Mikado, Utopia Limited (2016), Macbeth, La Sonnambula, & The Marriage of Figaro (2017), The Magic Flute, Die Fledermaus, & Carmen (2018).